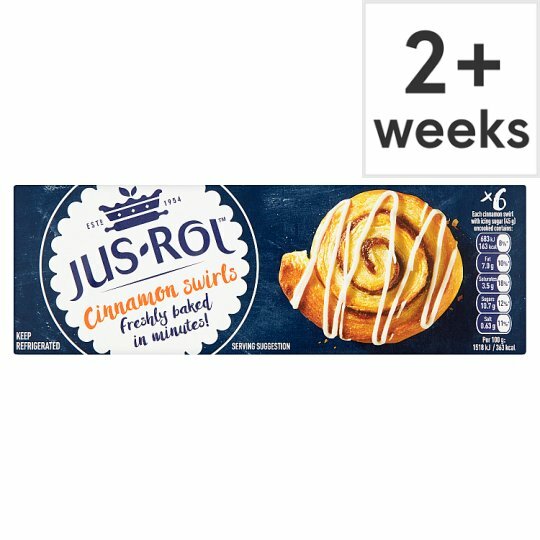 Chilled uncooked dough with cinnamon filling swirl and a pot of icing sugar. Preparation instructions: Preheat the oven to 200°C (180°C for fan assisted ovens)/Gas Mark 6. Line a baking tray with non-stick baking paper. 2. Allow cinnamon swirls to cool slightly, then drizzle the icing on top of baked cinnamon swirls. Note: Adjust icing consistency with more or less water until you achieve the desired thickness. Tip: For a glossy appearance slightly warm 2 tablespoons of apricot jam and brush on top of freshly baked swirls, allow to cool slightly, then drizzle the icing on top and enjoy!